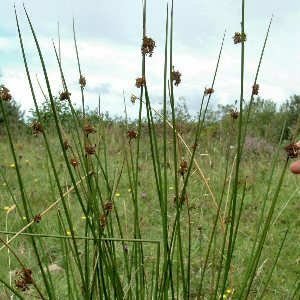 This is one of the commonest native species of wet pasture, bogs, wet woods and a variety of other damp, mostly acidic, situations. Locally it can dominate the vegetation. The plant has no proper leaves but consists of upright stiff pointed stems ranging from about a foot to five feet tall with the brownish tufts of flowers produced laterally about a fifth of the way down from the apparent top of the stem. The var. compactus resembles Juncus conglomeratus superficially in that the flowers are in a tight, not a loose, cluster, but it lacks the obvious longitudinal ridging of the stem of that species. 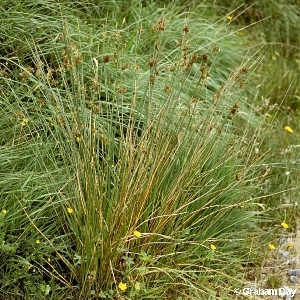 All names: Juncus effusus L.; Juncus communis auct.